Not everyone is extremely sensitive enough to EMF radiation, at least not enough to feel it’s constant effects and resulting symptoms. Some people do have what is called electromagnetic hypersensitivity (EHS). These individuals have consistent symptoms from EMF radiation and can literally feel its effects. Whether or not you are extremely sensitive to EMF radiation has nothing to do with the long-term damage it can have on your body. One of the best and first things that people can do is get a quality EMF protection pendant to help protect against some of this radiation. We don’t often think about how much EMF radiation we are exposed to on a daily basis. From your cell phone to your router, to your microwave oven, even your Bluetooth devices all emit a large amount of EMF radiation. Even the ambient EMF radiation from things like cell towers. Our bodies are constantly absorbing EMF radiation, and science has proven that this has a cumulative effect. One of the absolute best ways to protect the brain, the heart, and other internal organs is with an EMF protection pendant with properties that can absorb, shield, or block the EMF radiation that is all around us. Unfortunately, there are tons of products on the market, and it’s hard to know what works, what doesn’t work, and what to purchase. I wanted to put together a complete guide to help you navigate the sea of information and confusion surrounding EMF protection pendants. Do EMF Protection Pendants/Necklaces Work? This is a tough answer because there are so many different pendants on the market, using completely different technologies and concepts to protect against EMF radiation. So the short answer would be Yes, they absolutely can work, but there are many fake products on the market. Also, I do not personally believe that EMF protection pendants or necklaces can block or absorb 100% of radiation. I just have not seen any evidence that wearing a necklace, however powerful it’s anti-radiation effects might be, could protect me from putting a cellphone directly against my ear. I DO however believe that the necklaces I talk about below can absolutely help to reduce the total radiation you absorb by large amounts, just don’t assume that you don’t need to take other safety precautions. Some materials truly do have the ability to block EMF radiation, like metals used forFaradayy cages such as aluminum, copper, and mylar. These materials provide EMF radiation protection by scattering the photons as the radiation passes through. 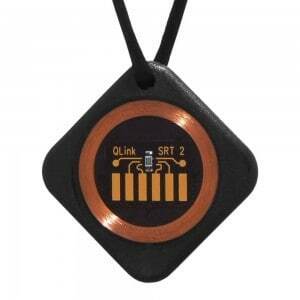 It’s important when shopping for the right EMF pendant that you research the technology behind it. For example, many pendants are made from Shungite (see my full shungite guide here). It can be helpful and reassuring to read about the technology and understand how it blocks or absorbs the radiation. 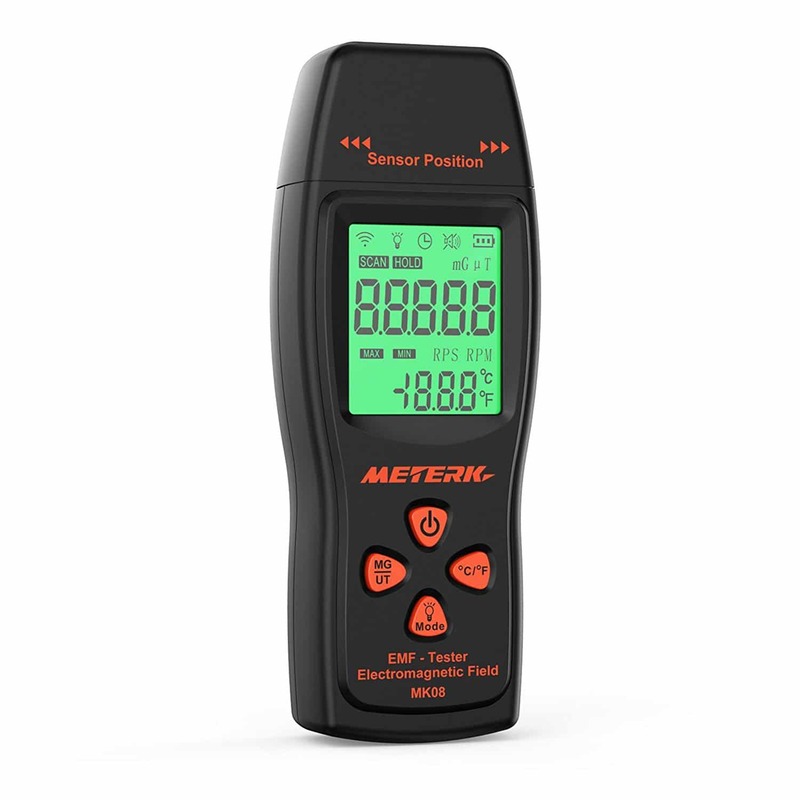 Some products that reduce EMF radiation will list the decibels (dB) of attenuation. You can use the chart to the right to understand how these ratings relate to the amount of radiation reduced. However, this is more common with materials that block radiation such as EMF protection clothing or blankets. If the pendant you are considering purchasing has no information about the technology providing the protection, along with studies, videos, or evidence that it works, I would steer clear. Now let’s look at what I think are the best EMF protection pendants currently on the market. This one from Karelian Heritage is my favorite EMF protection pendant, at least my favorite shungite one (in fact I got one for my wife!) First of all, it is just a raw piece of pure elite Shungite straight from the main deposit in Karelia, Russia. So the carbon content is 98%+, which is what you want in any shungite product. Since it is just a raw piece of unpolished shungite, it has the maximum ability to protect the body. This also allows each necklace to be completely unique and really beautiful. It is also quite inexpensive considering! How Does Shungite Protect against EMF radiation? Shungite is a very popular product in the world of EMF protection right now. The unique mineral found only in the Karelia region of Russia has all kinds of health benefits, but does it really it really block or absorb EMF radiation? From everything I can find and believe, shungite is probably one of the most powerful minerals at protecting the body from EMF radiation, check out the video below for a quick demonstration of this. Shungite contains a unique hollow carbon molecule called fullerenes. Until the late 1990s, fullerenes were only a scientific concept. Then scientists discovered that they naturally occur in shungite. It is these microscopic carbon cages that are believed to be what absorbs the EMF radiation and protects the body. For my full guide on Shungite, check out this post. The best black tourmaline EMF protection pendant I’ve been able to find is from Quanthor, you can check it out on Amazon. The Quanthor pendant strengthens the biofield of the body preventing EMF radiation from affecting the body. 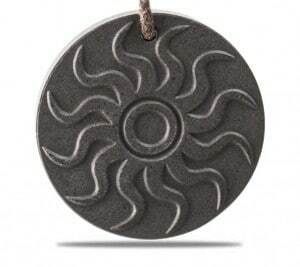 The pendant is also claimed to cleanse and purify negative energy, has a calming effect, and can even boost self-confidence (these benefits are a bit more faith-based, while the EMF radiation protection is more understood). You can check out the Amazon listing to read the reviews, they are extremely positive, with dozens of people having profound health changes in their lives. How Does Black Tourmaline Provide EMF protection? Tourmaline is a really unique gemstone. Some people refer to it as the “electricity stone” because it is the only crystal known to produce both positive, and negative ions in a single stone. Even as far back as the late 1800’s it was tested and proven to generate its own small electrical field. Then in the late 1980s scientists in Japan found that tourmaline, even when cutting into very small pieces still had the same properties, a positive charge, a negative charge, and the release of alpha waves. For these reasons, it is believed to be one of the most powerful crystals at providing EMF protection to the user. 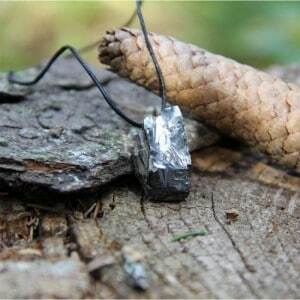 Instead of blocking or absorbing the EMF radiation itself, like the shungite pendant, instead, this crystal is known to empower the bodies own electrical field and allow it to protect itself from this radiation. Black Tourmaline also has many claimed health benefits and is used as a healing stone by healers and shamans around the world. 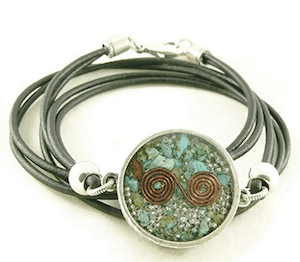 My favorite pendant that contains organite would have to be this one from Ayana wellness. We’ll talk about how organite interacts with EMF radiation down below, but suffice it to say this necklace contains both organite, and black tourmaline like we talked about above. One of the reasons I liked purchasing this pendant from Amazon is that not only do they give you the necklace, but they actually give you a free ebook on the power of organite for EMF protection as well as healing, which I found to be a really interesting read. They also “claim” that each of these pendants is charged by a certified Reiki master using earth attunement and Shuman Resonant Frequencies. I say claimed because I have not been able to confirm in any way that this actually happens with each pendant, or that the “charge” would actually make the pendant more powerful than without it. If it’s true, it certainly can’t hurt to align the pendant with the Shuman resonance. Now let’s talk a little bit about organite. What Is Organite And How Does It Provide EMF Protection? First of all, organite is just a substance that is produced using resin, various metals, and quarts, and has been known to balance and harmonize the body. What are some of the other benefits of orgonite? This is another orgone pendant that I like, mostly because it’s really unique, attractive, and has great reviews. It is a double sided pendant that has a quartz crystal, copper coils, small bits of genuine malachite chips, all sealed together in a green resin. If you’re interested you can purchase it on Amazon. This one is extremely popular, and the company claims it is used by pro athletes, doctors, celebrities, creative minds, business professionals, musicians, yoga, fitness & outdoor enthusiasts, and students. If you want to see the current price you can check out the listing here. Although I don’t personally believe that ANY EMF protection jewelry can block or absorb 100% of radiation, I do think they can have a profound influence on how much radiation we absorb on a daily basis. I think especially the products containing shungite and black tourmaline have real science behind their claims, and would certainly be worth wearing. 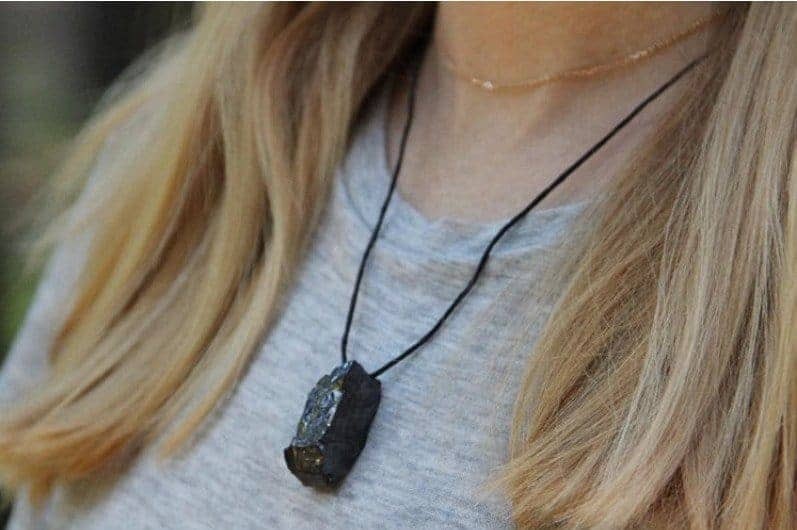 Personally, I purchased this shungite pendant for my wife, and this Q-Link pendant for myself because I believe in the technologies and want to try them for a while so I can monitor how they make me feel. Don’t get lured into thinking that a single piece of jewelry is going to solve your problems with EMF radiation and protect you completely. There are many simple things we can do to protect ourselves and make our homes safer. For tons of tips on this, I would take a look through all the articles in the Knowledge section of EMF Academy. Or, check out my favorite E-Book on EMF radiation. 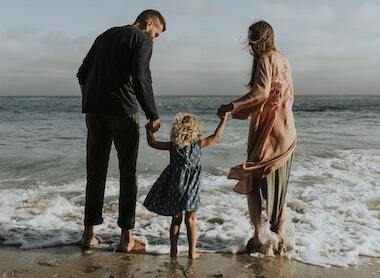 I truly hope you enjoyed my article “Best EMF Protection Products 2019 – A Complete Guide” If you did, please consider sharing! I have been coming to your blog for a long time now… I find you writing brilliant. Keep it up! I have been coming to your site for 1 year now. I find that it is informative and well thought through. Keep up the great blogging! I’ve just discovered your website and I have to say a very big THANK YOU for sharing all your knowledge with others. It means a lot. Especially for me as I’m hyper sensitive to EMF radiation and chemicals. They have just rolled out 5G in my apartment building two days ago and it’s making me very sick – the usual symptoms but more intense especially in the brain and aching pains in the heart region. Just when I thought I had all my computers and wifi shielded now I have to wear the EMF clothing non-stop until I can get out of this place. And go where? At least we humans can find protective devices and clothing, it’s the animals, birds and plants I feel sorry for. What are they doing to our beautiful world?